Why Should I Hire an IICRC Certified Technician? Have you had your fair share of dodgy carpet cleaners? Maybe you’ve heard horror stories of carpet being left wet for days, spots reappearing, or companies charging much more than originally quoted? Luckily there is a way to easily identify a reputable company to avoid these experiences! The Institute of Inspection, Cleaning and Restoration Certification (IICRC) is an international non-profit organisation committed to developing standards for inspection, cleaning and restoration, and certifying companies that meet these standards. 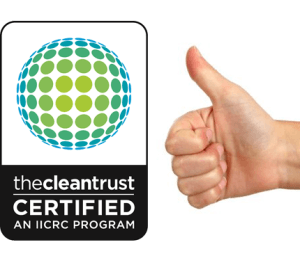 To earn IICRC-certified status, a technician needs to have studied and passed comprehensive examinations in specific cleaning, restoration and inspection areas such as carpet cleaning, upholstery cleaning, hard floor cleaning, odour removal and more. They also will have gained extensive field experience and are kept up-to-date on the latest industry developments and technologies by following a continuous education program. Look for the cleantrust logo! It verifies IICRC Certification and is a symbol of quality, so you can be confident you have hired an experienced and qualified professional to care for your home and is committed to high, ethical standards. This logo eliminates those wannabe cleaners, so you can rest assured you’re making the right choice. And how do you double check they are legitimate? You can refer to the IICRC website which lists Certified Professionals. There’s an old saying that “you get what you pay for” and this couldn’t be more true in the cleaning and restoration industries! If you’re searching for the best way to maintain a cleaner and healthier home, then look no further than Crystal Clean Carpet & Tiles: IICRC- certified, experienced professionals who will deliver results you can trust to maintain your flooring and fabric properly – a sure bargain!